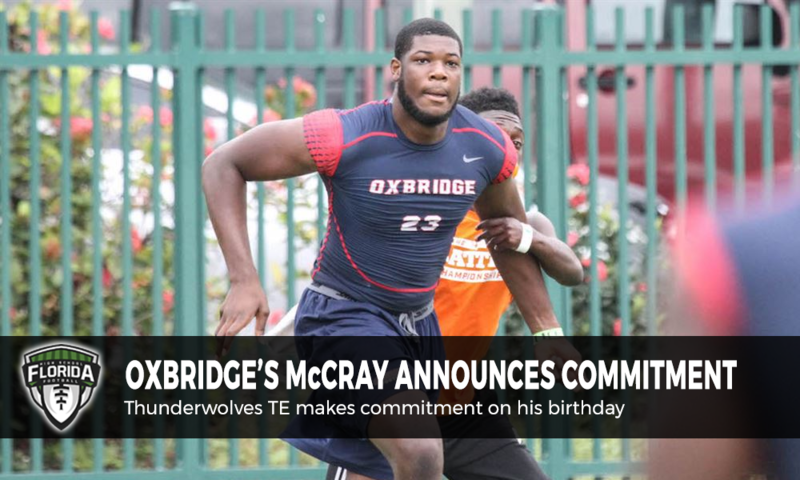 Herman McCray is a two-star tight end out of Oxbridge Academy (West Palm Beach). Early Saturday morning, McCray announced his commitment to Georgia State for the 2018 college football season. McCray was being recruited by other schools, such as nearby Florida Atlantic, and a collection of teams without major national recognition, but that have fared well in recent years. Some of these schools were Iowa State, Louisville, and Virginia Tech. McCray’s decision and the announcement came via Twitter, and uniquely, he decided to make up his mind on his birthday. Georgia State is currently 6-3 and is in first place in the group-of-five Sun Belt conference. The team currently has Ari Wertz starting at tight end, who has 260 yards on 18 catches this season. McCray will join a recruiting class Georgia State has put together that emphasizes offense, with a 3-star running back, 3-star wide receiver, and 3 offensive linemen already committed. All commitments are non-binding until official the Letter of Intent is signed in Early Signing Period (Dec. 20-22, 2017) or starting on National Signing Day (February 7, 2018).